Fellows are ready to educate, empower and connect! 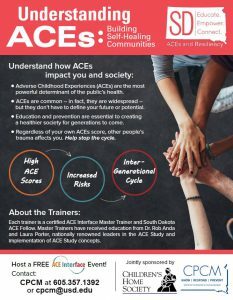 Through unprecedented collaboration, Children’s Home Society of South Dakota and the Center for the Prevention of Child Maltreatment at USD were able to bring ACEs training to South Dakota professionals and to develop ACE Master Trainers in our state. The first cohort of ACEs & Resiliency Fellows met January 24-25, 2018, in Rapid City, South Dakota. Twenty-six individuals from multiple sectors across the state were selected to participate in a training and learning community focused on building self-healing communities. Participants spent two days with Dr. Robert Anda, Laura Porter, and Kathy Adams learning about the impacts of trauma, the ACE study, and how to support positive change within a community. After two intense days, fellows returned home with the tools they need to bring ACEs training back to their communities. We are excited to get this message out across our state. If you interact with humans, you need ACEs training! Contact us to learn more about how to get this FREE training in your community. Adverse childhood experiences (ACEs) are stressful or traumatic events that happen in childhood. ACEs include abuse, neglect and household dysfunction. The CDC Division of Violence Prevention, in partnership with Kaiser Permanente, conducted a landmark study from 1995 – 1997 with more than 17,000 participants regarding ACEs. The ACEs study reveals staggering proof of the health, social, and economic risks that result from childhood trauma. STRESS: Toxic stress damages the developing brain architecture, which can lead to life-long problems in learning, behavior, and physical and mental health. DEVELOPMENT: The more adversity a child experiences in the first 3 years of life, the greater the odds of developmental delays. HEALTH: Early high stress experiences imbed into the body with lifelong cognitive, emotional, and physical health effects. What were the adverse childhood experiences studied? To augment the Understanding ACEs curriculum, we recommend increasing community awareness through public film screenings that address ACEs science and trauma informed care. Through the SD ACEs and Resiliency program, we can help you plan a community screening to introduce a larger, more diverse audience to the science of adversity and community resilience. The original research was controversial, but the findings revealed the most important public health findings of a generation. RESILIENCE is a one-hour documentary that delves into the science of Adverse Childhood Experiences (ACEs) and the birth of a new movement to treat and prevent Toxic Stress. Now understood to be one of the leading causes of every- thing from heart disease and cancer to substance abuse and depression, extremely stressful experiences in childhood can alter brain development and have lifelong effects on health and behavior.